BIRMINGHAM, Alabama (May 23, 2016) — Food service equipment, furniture, medical equipment and thousands of other items that were used in Trinity Medical Center’s Montclair Road facility before it closed are being sold in a series of online auctions managed by Pearce & Associates. 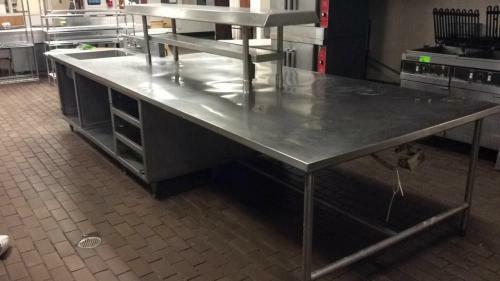 Bidding is already under way at auctionbypearce.com, with the first auction – featuring food service equipment – set to end Wednesday, June 1. Among the items being sold are walk-in refrigerators, grills, deep fat fryers, ovens, microwaves, rolling food service trays, griddles, tables and chairs. “Because of the extensive cafeteria and food service requirements of a modern hospital, this auction includes a great deal of commercial food service equipment that will be of interest to those equipping restaurants or commercial kitchens in organizations like churches or schools. Also selling are numerous lockers, which would be of use to schools, health clubs and other organizations,” said Chip Pearce, president of the auction company. Other items include water coolers, janitorial equipment and supplies, fluorescent light bulbs, baby changing stations, hoods, deep well sinks, and tray carts. “A lot of this commercial grade equipment is very expensive if purchased new, so it’s likely that some people will get the items they need at a fraction of the price they might have expected,” said Pearce. Additional auctions, which will be added in coming days, will feature office equipment, phones, monitors, copiers, printers, office and lobby furniture and cabinetry, among other items. Items will be available for inspection from 9 a.m. to 3 p.m. Friday, May 6, and Tuesday, May 31. Individuals seeking additional information may visit auctionbypearce.com or call 205-664-4300. Pearce & Associates, based in Alabaster, markets real estate and other assets throughout Alabama, primarily through online auctions. Clients include estate executors, business owners, attorneys, bankruptcy trustees and individuals. The firm also has ongoing contracts with many cities and counties for the sale of surplus materials.